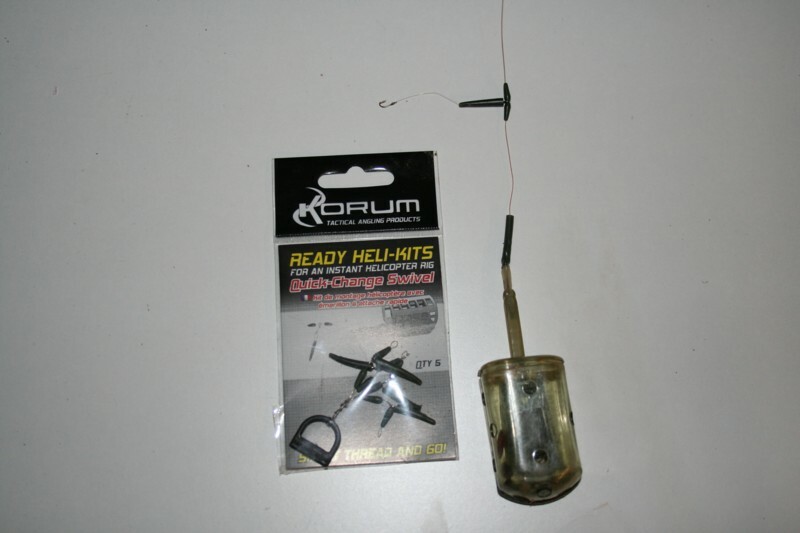 The short helicopter rig has been around for many years and has accounted for some large carp. 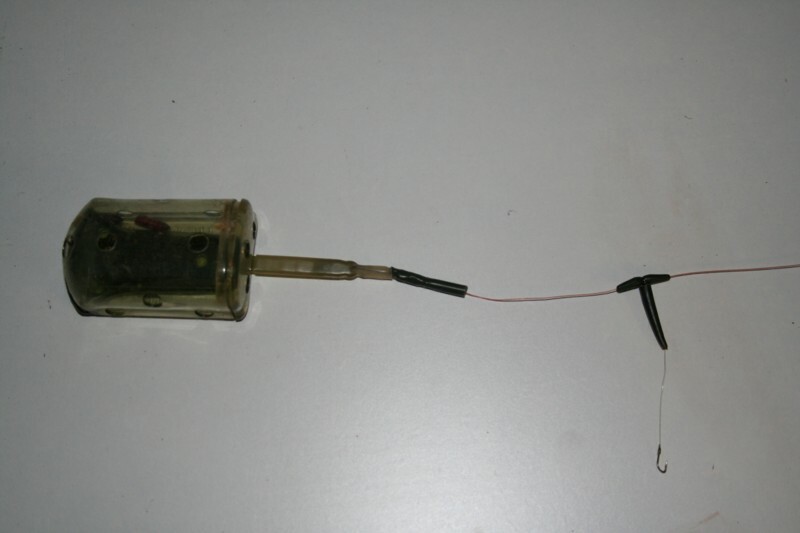 This rig has been adapted by specialist anglers to target many other species incorporating a heavy swimfeeder. 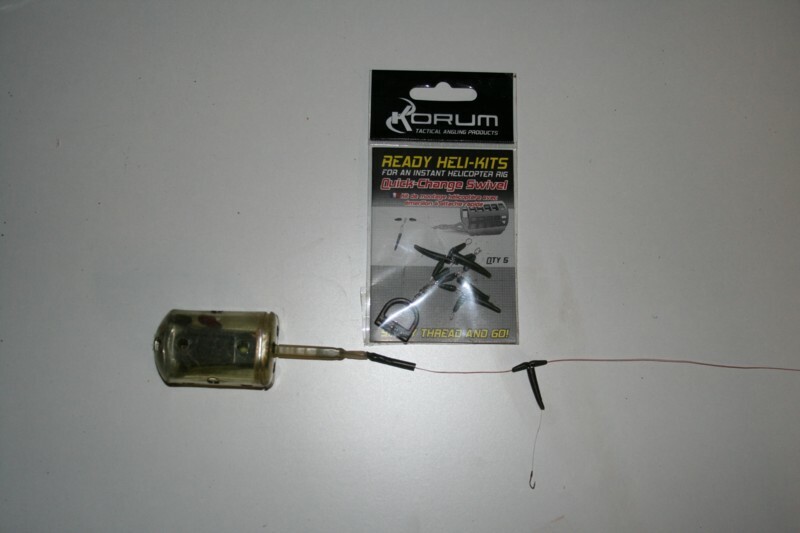 This heavy feeders acts similarly to a lead whereby the fish bolts when the line tensions between hook and swimfeeder normally resulting in self hooked fish. The rig is similar to a method feeder one where small areas of food pockets get the fish mooching around they haveplenty of free food but close-by is the one with the hook in it. The method is simple yet very effective when the hooklink is at it’s shortest and the fish has little time to eject the baited hook. Normally I fish with something like a 1.5-2″ hooklink which believe me is very tricky to tie. The hooklink itself needs to be sufficiently strong to take the bolt action of the fish and the resultant strain on the line to the feeder. Of course the line needs to be strong enough to land the fish. It goes without question to fish a 2lb hooklink and a size 18 hook for tench on this rig would be tempting disaster. However depending on weed condition etc in a lake a 3.5lb hooklink might just do the trick. Conversely fishing for roach in winter using a size 20 hook and 2lb line might just buy you a bite but you will need to play the fish very gingerly. So what I’m saying is think very carefully about hooklink choice and be sensible. Main line choice too is important. What I’m thinking about here are two factors. The reason behind the distance in casting is that there will be much more stress on the line if you are casting 70yds as apposed to fishing at 35yds. So think about what strength line will be needed. The second issue about swimfeeder weight also applies to line strength. If you using a 25g feeder then the line can be of a lesser breaking strain than if using a 60g one. There can be some compromises here and again some thought needs to be made. Don’t forget an empty swim feeder weight will be 25g but a full one could be significantly more. For most of my fishing I use line of about 8lbs for distances of up to 5oyds and 25g feeder. The rig comprises of two rubber stops trapping a small swivel between them on the main line. You attach the hooklinkto the swivel. You can see from the photo that there is an additional rubber sleeve that keeps the line where ever possible out from the main line. You are able to make these up yourself using Korum parts of the rig. If you can’t get all of the bits that are required to make the rigs then they have pre-made ones. These are very good and are easily fixed to the line. They could be termed a lazy way, but in frosty conditions where 2lb plus roach are feeding it’s easy and importantly quick. The swimfeeder is tied to the main line and a piece of silicon is pushed over the swivel to keep it all tidy and neat so that no line gets caught up. Normally you need to fish fairly tight lined from the rod to the feeder to have that bolt effect. Quite often though a hooked fish will give a slack line bite as it bolts off and the bobbin indicator will just drop. I haven’t talked about rods but will just a little because this is important. Because the hooklinks are likely to be much lower breaking strain than the main line caution needs to be taken whilst playing any fish. The rod needs to be able to take the lunges of fighting fish so a 3lb test curve rod may not be ideal. A softer action rod is needed so that as the fish comes in closer ready for netting it is able to absorb these lunges. My preference is for a 1.5lb test curve rod with a quiver tip section and the clutch set quite light on the reel. After all you don’t want that fish of a lifetime to be lost. Why not give them a go and see what happens I think you will be surprised. The last photobelow is another helicopter rig that I’ve used to catch some of my big roach to 3lbs 13oz from Willow lake. What I like about this rig is that I’ve reduced the size of the stops and the quick change swivel. Everything is therefore lighter in weight and causes less resistance. For tench you may want to increase the hooklink line size but it depends on the weed present. 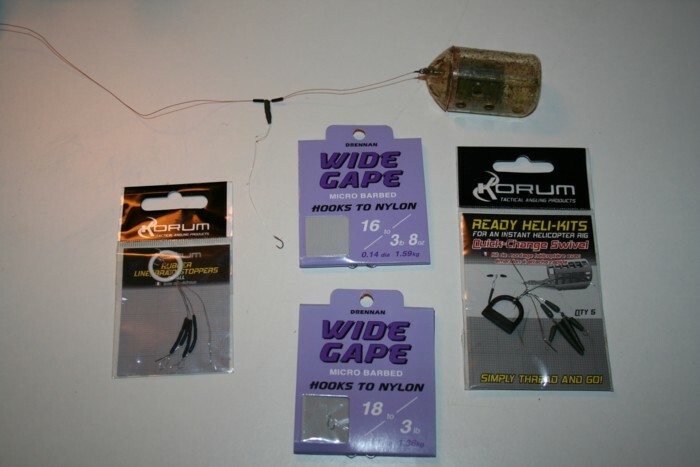 I’ve seen 35lb carp caught on these rigs and 4lb hooklink, but wouldn’t recommend it.